Happy Friday y'all! 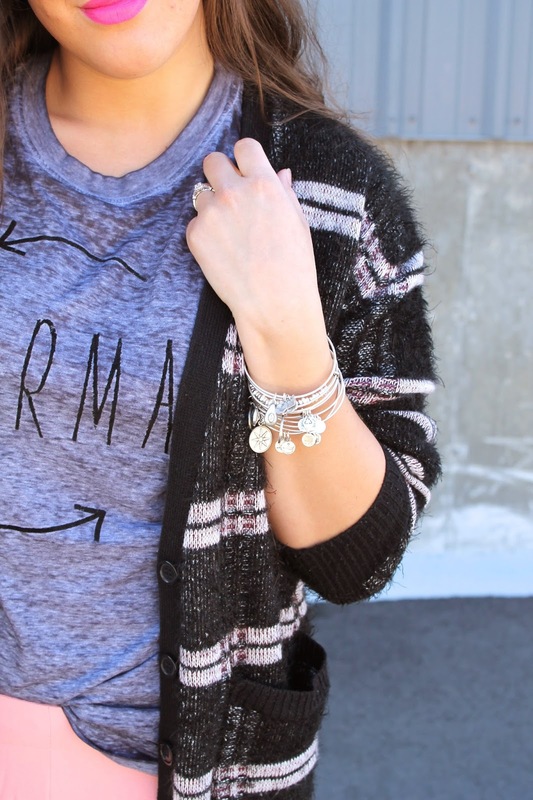 I'm pretty in love with this Karma tank! I could wear it non-stop. Not only is it super cute but I'm all about what it represents! 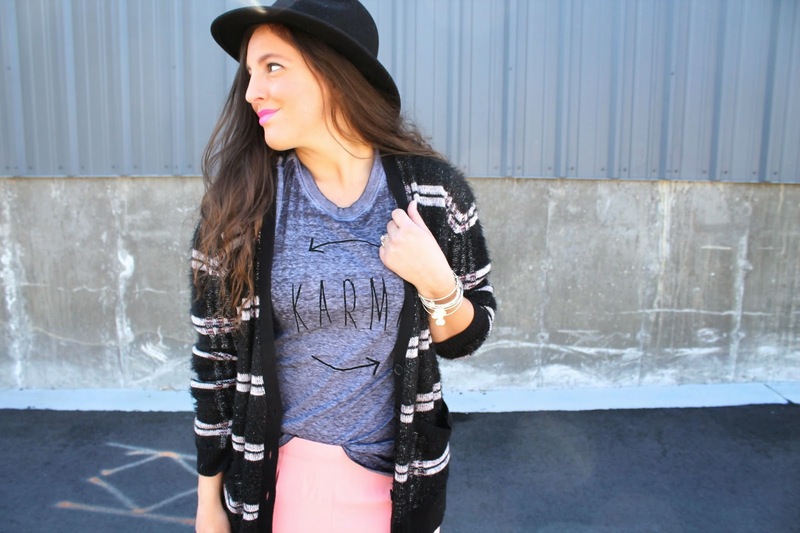 I paired it with these cute shorts from Pink Blush to soften up the look! My good friend Kristin from Wild One Forever is having a birthday today and I teamed up with her to give y'all an amazing giveaway!! There's not just one prize up for grabs today, but EIGHT amazing prizes! There will be 8 different winners. One for each gift. The giveaway will run from today (March 27th) until midnight of next Friday, April 3. I will announce winners the following Monday. You must be a U.S. resident. Just complete the easy steps in the rafflecopter below and remember, the more steps you complete, the more opportunities you have to win! Now for a list of the prizes! These suits are reversible, adjustable, and can be worn multiple ways! Loving their fun prints!!! No restrictions! Pick any item from Pink Blush or Pink Blush Maternity! Vintage inspired customizable swimsuits that give you the perfect fit! I would love to go to Palm Springs and stay at a resort for my birthday this year. And I would love to win the 75 Giftcard to Candy Strand Swimwear so I could have a new bathingsuit when I go. I would love to road trip to the beach with friends. I love the any item from Pink Blush. For my birthday I want to stay at the St Regis in New York. All the prizes are amazing, but I love the Marc by Marc bag. I would love to stay in a hotel ALONE! Room service, bed early and sleep late....to dream!!!! I WANT that Anthropologie card!!! A gift card to treat myself to a new swimsuit would be awesome! Thanks for the chance! I hope to win the $150 Anthropologie Giftcard!! thanks so much!! I would get the FUCHSIA WHITE PRINTED MAXI DRESS if I win. I like to celebrate with friends and family over dinner or appetizers. It's difficult making a decision about the prizes but I'm going to say the Anthropolgy gift card because I do not need the tote as much as I would love to have it. A beach getaway for my birthday would be great! I'd love to have the Anthropologie gift card. Multi-Colored Striped Lace Print Knit. I would love to go to the beach for my birthday and my favorite is the Anthropologie Giftcard. What a wonderful giveaway opportunity. I think I would get the JADE GREY STRIPED HI-LOW TANK TOP. I am most excited about the $100 Tai Pan Trading Giftcard. If I won the pink blush prize, I would choose the Fuchsia Navy White Colorblock Chiffon Dress.